The Swedish Chamber of Commerce India in collaboration with Embassy of Sweden in New Delhi cordially invites you to an exclusive meeting with the National Board of Trade, Sweden (Kommerskollegium), represented by Ms. Nesli Almufti and Ms. Helena Hafgren. 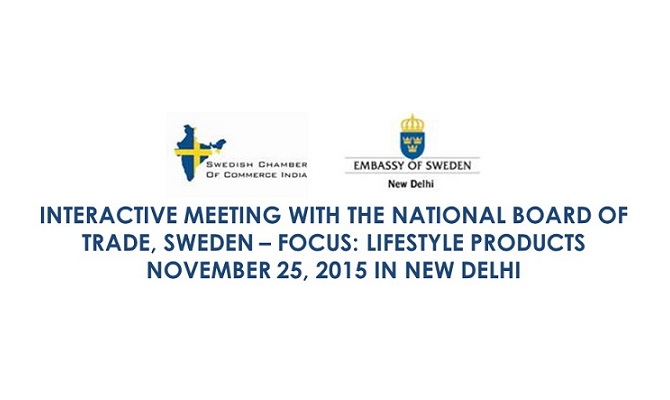 Ms. Almufti and Ms. Hafgren will be in Delhi to support India in terms of readiness to export to Sweden/ Europe and will participate in a seminar on Sweden-an Emerging Destination in EU for Lifestyle Products organized in collaboration with Federation for Indian Exports Organization on 27 November in Delhi. The purpose of this meeting is to engage in a dialogue regarding your experiences while choosing suppliers, adherence to code of conduct, export and sourcing and an overall view of doing business in and with India. This meeting is especially curated for companies within the Lifestyle sector (trading and sourcing out of India) but everyone interested in the topic is of course welcome.